With Canucks training camp just around the corner, much of the talk going forward will be the question of which Canuck is going to resurrect his career this season. Jeff Tambellini? Joel Perrault? Raffi Torres? Kevin Bieksa? One could make a case for each of these, and that's good. Mike Gillis is hoping the desperation of these talented near-washouts is going to augment competition, and hopefully propel one or more of these once highly-touted players to great heights. But, if there's one player who's really seen his stock fall, one player who I think has the sack (so not Salo) to return to the glory of his youth, it's Daniel Sedin. Quit your tittering; I'm deadly serious. 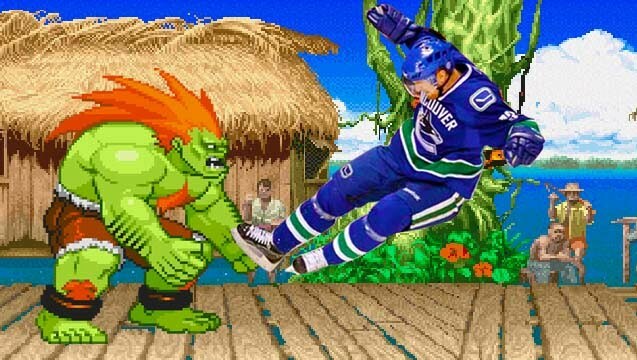 Daniel Sedin will be out for blood this season. Until last season, Daniel was arguably the better Sedin. Sure, he and his brother's point totals were effectively interchangeable, but he tallied more goals than Henrik in 8 of their 9 NHL seasons together. And, since "he doesn't shoot the puck enough" is a much more common critique of a player than "he doesn't pass the puck even though he's three feet from the goal-mouth enough", Daniel has typically coasted on a stream of goodwill while Henrik gets a tongue-lashing for his unselfishness. Yes, the points were about the same, but, you know, goals. That all changed this season, when Daniel went down with an injury and Henrik wound up scoring the same amount of goals as his brother, so basically, Daniel was no longer contributing anything and Henrik was carrying him. Not that famously unselfish Henrik would have minded carrying his brother, but the league took notice that one Sedin was great and the other sucked so hard. I mean, check out Henrik's amazing pass and Daniel's lousy tap-in on this play. Henrik went on to win the Hart trophy. The media lobbied for him to be given the captaincy. Henrik became beloved. Meanwhile, even though Daniel Sedin's point per game totals were higher, he was buried--basically forgotten. Recently, the Hockey News named Henrik Sedin the 6th best player in the NHL. Daniel? Basically spat on with an 11th place ranking, as though saying, "You're nothing, Daniel!" Yesterday on the Team 1040, Dave Pratt asked Daniel how he and his brother can possibly follow up the remarkable season they had last year. Daniel responded by reminding Pratt that, hey, we haven't won anything yet. Then he paused. "Well, I haven't." He said, with his typically dry humour. But wait: was it dry humour or was it the flaming sword of spite? We can't know for sure, so it's likely the more incendiary one. As an unofficial member of the Vancouver media, I think we should roll with it. So you heard it here first. Daniel Sedin hates his brother (E4). And why wouldn't he? They're twins with nearly identical career totals, but suddenly, Henrik is the superstar? It's bogus. Henrik is the one getting trophies and wicked photoshops. Henrik is the one who was shown respect with an "A" last season, and has been talked about for the "C" this season. And if he gets it, what will Daniel get? Likely, a pitiful "A". How disrespectful. Henrik is the one called Henrik. Daniel? They call him "Brother Daniel", like a second-rate citizen, or a monk (society's self-made second-rate citizen). He's more than just Henrik's brother, you know; Henrik is also his brother. So there. Even when Henrik gets insulted, it's actually directed at Daniel. "Your brother is ugly," says Adam Burish. Sure, Henrik can get upset about what's implied, because he has a similar look, but what about was said? Who's standing up for Daniel? Not Darcy Hordichuk, because he's not in the lineup that day. Why not? Because nobody thinks about Daniel Sedin. It's time for Daniel to think about himself. Stop helping your brother by scoring goals. Score goals to spite him. 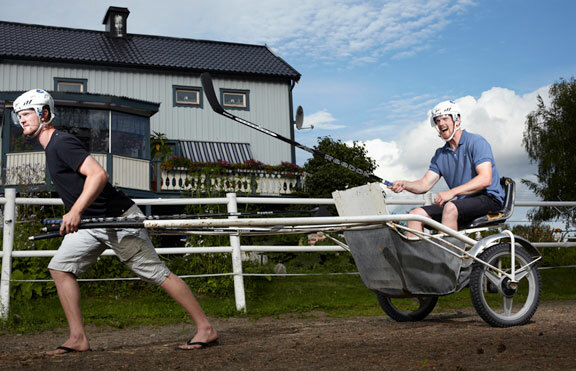 I personally guarantee you that Daniel Sedin is going to be downright motivated this season. It's time he put his brother back in his place. Mark my words: Daniel Sedin is out for blood. Note: I added this picture because it's incredible. I don't doubt that Daniel is going to have a great season, be motivated, and all that stuff... so I get what you're driving at, but to say he's "one player who's really seen his stock fall" is insane. The guy had a career-best 85 points despite missing 19 games. If career years = stock falling, let's hope that's the case for the entire team. Hey Nick. I'm joking. Daniel's stock has only fallen when you compare to it to how high Henrik's has risen. The joke is that poor Daniel has to deal with that. This was hilarious. Thanks for making my day. I fully enjoyed that. Props to you, my man. Oops, nope, I had to fill in a captcha thing. I'd like to change my previous comment to "I enjoyed that", as the two seconds of my time lost effectively tarnished the "fully" status. And now look at me wasting time. Can't wait to see what I write after the SECOND captcha. Captcha is ruining the enjoyment of Pass it to Bulis! We're doomed! WOW this was a stupid article... your a moron for thinking that "nobody" cares about daniel but "everybody" loves hank.... Who are all these people that you are polling to determine this??? WOW that was a stupid comment... your a moron for not realizing that "nobody" else took this seriously and "everybody" realized I was kidding... Who are all these people that can't pick up on this??? I'd just like to issue an apology to anonymous. I was mimicking the writing style of your first paragraph, but it forced me to call you a moron and I don't like to do that. You're probably pretty nice in real life. Nice! That made me laugh. And this last picture is better than a photoshop. It's fantastic. Well done, Harrison. Well done. Also, I like the new and improved header. I like the old one too (not the old old one, but the old new one), but this one is even better. Well done to that too. Bieksa's the MAN! He's going to fill in on the top line for the injured Burrows for the first fifteen games, then get dropped back to the fourth, where he's better on face offs than Rypien. Awesome article. good laughs. i hope Daniel smites goalies all season long with the flaming sword of spite. It's a no-brainer that Daniel will be highly motivated this year. Daniel also constantly stuggles with the adversity that comes with being the little brother. Being five minutes younger is surely a reason why his play is dwindling as Henrik's has taken flight. He would be nothing without big brother Henrik carrying his career. You, most recent anonymous, are my favorite anonymous. Not like he needed more, but on TSN, Henrik was ranked 6th in the league while Daniel was ranked at 18th. Seems worse than THN's 11th ranking, as Daniel was 12 ranks removed from the brother who he's always thought of as AT BEST his equal. I may or may not have tears in my eyes. Well done. Daniel's gonna win the Art Ross. Mark my words. Snaptube is a readymag.com free application which is readily Check this Website available for those that enjoy Snaptube APK Download for Android device , iPhone iOS, PC to enjoy online videos which Snaptube Download you like YouTube, Facebook and also Instagram, Snaptube this function of Snaptube app. the sleep timer after which the video doattend.com/ stops automatically when Here the timer stops. So, by acquiring its premium Mobdro Download Best Guide - PC, iPhone & Android feature which will certainly set you back couple of Mobdro dollars a year, this application Mobdro App becomes more convenient to utilize and is easy to use. Is Lee Sweatt the Next Brian Rafalski? Morrison as a Fourth-Line Centre?